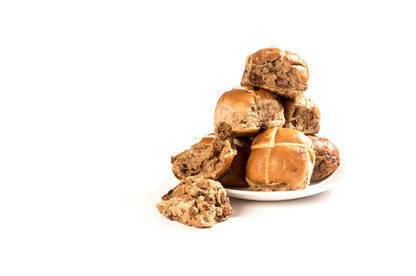 Our labelling laws make it easy for supermarkets to hide palm oil in your hot cross buns. Hot cross buns are a classic Easter treat. However, at some supermarket bakeries it’s impossible to tell from the label if your buns contain palm oil or not. Our shoppers visited the bakery sections of Countdown, New World and Pak’nSave supermarkets in Auckland, Wellington and Christchurch to find out what was in their hot cross buns. At New World and Pak’nSave, both part of the Foodstuffs stable, not all the hot cross buns from their bakeries had an ingredients list (products made in-store don’t require one). Those that did only listed “vegetable oil” – a catch-all label for any oil derived from vegetables. Could it be palm oil? Yes. A Foodstuffs spokesperson confirmed some of its in-store bakeries used palm oil. Countdown used canola oil in its hot cross buns. Unlike New World and Pak’nSave, Countdown’s buns all had ingredients lists on the packs. Hot cross buns are far from the only product where palm oil may be lurking. If the ingredients list contains “vegetable oil”, there’s a good chance there’s palm oil. Both Countdown and Foodstuffs belong to the Roundtable on Sustainable Palm Oil...[it's] come under fire for its certification system, which doesn’t guarantee the oil that ends up in consumer products is sustainably sourced. Manufacturers love palm oil because it’s cheap and versatile. However, it comes with a huge environmental cost. Palm oil plantations in Indonesia threaten the habitat of Sumatran tigers, rhinos and orangutans. Fires from deforestation are the largest source of greenhouse gas emissions for the country. Both Countdown and Foodstuffs belong to the Roundtable on Sustainable Palm Oil (RSPO), a largely industry-led initiative set up to certify “good” oil. However, the RSPO has come under fire for its certification system, which doesn’t guarantee the oil that ends up in consumer products is sustainably sourced. Foodstuffs uses RSPO palm oil certified as “mass balance”. Mass balance oil contains certified palm oil mixed with non-certified stuff. Countdown uses both mass balance and RSPO “segregated” palm oil in its products. The latter is certified palm oil that can be traced to mills. It also has a few food products that use RSPO “book and claim oil”, which isn’t traced. Kiri Hannifin, Countdown general manager of corporate affairs, safety and sustainability, said over half of its store-brand food products used segregated oil. Mass balance makes up the rest. The company lists palm oil on its products. We’ve been calling for labelling rules that would require manufacturers to disclose whether there’s palm oil in their products. There’s strong support for better labelling. Our 2018 survey found 68% of consumers thought palm oil labelling should be mandatory. A 2011 review of food labelling laws also recommended added oils be listed on product labels. However, progress has been slow. At its next meeting in May, the New Zealand and Australian Ministerial Forum on Food Regulation will be reviewing advice from officials on labelling rules. We think it should be an easy decision: just label it. As far as I'm concerned, no palm oil is good palm oil. RSPO has been exposed time and again as corruptible because it is industry-regulated - like putting a mouse in charge of cheese supply. So only when consumers start to refuse purchasing food, cosmetics, household cleaners, etc that contain "vegetable oil" or any of the many pseudo-chemical names for palm oil (lists widely available online), and put the pressure on manufacturers' profits, will there be any change. THERE IS ONLY ONE REASON THAT PALM OIL IS BEING USED IS PROFIT,THE SOURCE AND DAMAGE MEAN NOTHING TO THE FOOD CONGLOMERATES. IT'S A SHAME THAT OUR GOVT CAN'T GET THEIR ACT TOGETHER AND FORCE CLEAR LABELING ON ALL FOOD INCLUDING GM GROWN PRODUCTS, IT'S APPARENT THAT PEOPLE DON'T HAVE THE RIGHT TO KNOW. The best hot cross buns I've ever had were the Freya's brand but they have stopped making them which is such a shame. I have contacted them but they aren't going to make them again. The best are always home-made. Crossed or not, you can vary the fruit/spice/fats/oils to suit your taste. Just follow a basic recipe and have fun in adding all your favourite ingredients, fun in the mixing and shaping, fun in the baking and even more fun in the eating. The smell is so enticing. Or get really extra lazy and make a very special fruity loaf in the breadmaker. Call me old fashioned but I'd just like to buy a normal Hot Cross Bun with flavour - I don't want chocolate in it, I don't want a Brioche bun, I want fruit mixture, candied peel and spices. The only decent ones I've tasted are the Rosedale brand but can't find them in my supermarket - any suggestions? 4 & 20 Bakery in Clonbern Rd Remuera Auckland, has great hot cross buns. More expensive than the mass produced ones but if you want something different give them a try. I make my own. It's not hard. All the mixing and proving is done in the breadmaker, shape then allow to rise in the fridge overnight, bake in the morning.